The Healy Raes are from Kilgarvan, not Killorglin. 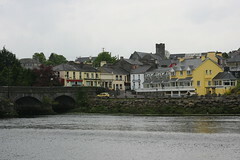 Killorglin is a goat worshipping merchant town, Kilgarvan is the home of the Healy Raes. Kilgarvan consists of the local pub, garage, shop post office and plant hire business all owned by the Healy Raes and a couple of dozen houses that their staff and captive customers live in. In the last two weeks both the Phoenix and now the Village Magazine have referred to the Healy Rae as being concerned first and foremost with the potholes of Killorglin. They aren’t, they’re concerned with the potholes of Kilgarvan. I come from Killorglin and while we do indeed annually crown a goat as our king for the 3 days of Puck we were not in the habit of electing one to the Oireachtas for years on end. So I’d love if people could remember which is which, Killorglin is home to a goat King 3 days a year, Kilgarvan sends one to Dublin most weeks on the train. This entry was posted in 2010 and tagged Dublin, Fianna Fail, Goat, Jackie Healy Rae, Kilgarvan, Killorglin, Oireachtas, puck fair. Bookmark the permalink.